When it comes to your Oriental rug, you have made an investment that you want to last, and the best way to do that is to have your rug cleaned by professionals who have been doing this for decades. 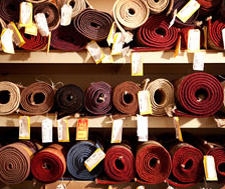 At Fred Remmers Rug Cleaners, we have been serving clients just like you for more than 135 years with the same level of expertise and dedication to our craft that has made us a name across the country. Our Memphis handwashing services offer the finest, most detailed Oriental rug cleaning in the industry, so contact us to get your free estimate today. We take the greatest care when handling any Oriental rug, and will always perform a complete assessment of the piece before we touch it. 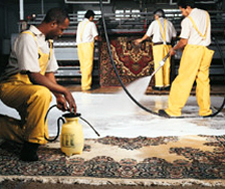 This ensures that your rug receives only the best treatment for its unique condition, color, style, material, and age. If our experts determine that a hand wash is right for your rug, then we’ll start with dusting and beating. The majority of the wear and tear found in Oriental rugs (other than stains and spots) is caused by a buildup of dust and debris. Our dusting and beating process gently removes all of the dry dust and dirt lodged in between the fibers of your rug, so the fibers can breathe without compromising their delicate weave. We take special care with antique or compromised rugs, placing the rug between two pieces of screen to ensure the best results while maintaining the rug’s structural integrity. After the dusting, we perform a 24-hour color stability test to ensure that the colors won’t run. If a rug fails this test, we take extra precautions to ensure that there is no color transfer throughout the washing process. In addition, we assess and treat unstable ends and damaged areas with extra care before the washing process, to ensure we have the best cleaning technique for the rug. After we have stabilized any fragile areas, we fully immerse the rug in a tub with a natural soap specifically formulated to be gentle yet effective and to protect the natural oils and lanolin from the wool fibers in the rug. For most cases, the rug is then agitated on both sides to make sure the solution reaches every fiber. 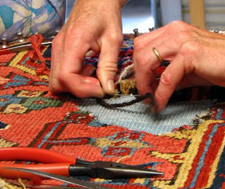 In the case of antique rugs or those that require special attention, we hand-brush the rugs instead of agitate them. In this immersion tub, we constantly circulate the water to ensure that the rug is not sitting in dirty, stagnant water. This way, we are able to help stuck in dirt and set stains dissolve away from the fibers deep within the rug. Our rinsing process is thorough and includes flushing all of the contaminants, leftover soap, and dirty water out of the rug using a gentle, massaging flushing tool. 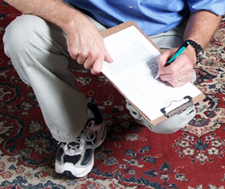 This step may be repeated several times to ensure the rug is sparkling clean. After the rug is completely rinsed and clean, it is laid out on a screen to air dry in a climate controlled, dehumidified area to improve and expedite the drying process. The fringe is addressed while the rug is laying out to dry. We never use chlorine bleach on the fringe, as it causes the fibers to deteriorate and warp over time. Instead, we use a potassium bisulfate-based solution, which is gentle on and effective on cotton. While cotton fringe will gray over time, this doesn’t mean it is dirty, it simply is what happens to the material as it ages. Dust again with a dry air tool to remove any stray lint or dust that might have been missed the first time around. Groom the rug by brushing and vacuuming it. Our hand wash process is designed to make your Oriental rug look, smell, and be cleaner while ensuring it will last for many years to come. 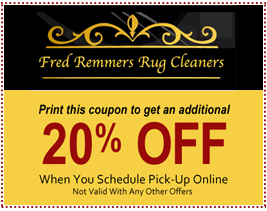 We know you’ll love the extra care your rugs receive at Fred Remmers, so contact our team today!